Louis I. Newman (1893-1972) received his rabbinical ordination from Rabbi Stephen S. Wise, and served as Wise’s assistant rabbi at the Free Synagogue, in New York City, before becoming the spiritual leader of San Francisco’s Temple Emanu-El in 1922 and, later, the rabbi of Congregation Rodeph Shalom, in New York City. He was nicknamed “Battlin’ Louie,” in part because of his advocacy of Zionism, a minority position in Reform Judaism at the time. Following the rise of Adolf Hitler and the Nazis to power in 1933, Newman actively supported the movement to boycott German goods. In 1935, he became president of the U.S. wing of the Revisionist Zionist movement, known as the New Zionist Organization of America. 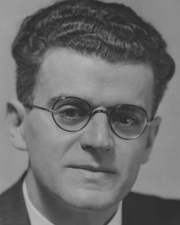 Much to Rabbi Wise’s dismay, Newman also became one of the leaders of the American Friends of Jewish Palestine, a forerunner of the Bergson Group, which was set up in New York City in 1938 to mobilize support for unauthorized Jewish immigration to Palestine (aliya bet). Rabbi Newman and AFJP director Yitshaq Ben-Ami raised the funds needed to free the S.S. Sakarya, a ship with 2,300 Jewish refugees that became stranded in the frozen Danube River on its way to Palestine in early 1940. Baumel, The Bergson Boys, pp. 40, 46, 61.